Although the subject of aerodynamics has been with us for a long time and from a scientific perspective it is predominantly exhausted - within the framework of the UCI policy - triathletes or time trial specialists keep finding ways to improve aerodynamics. 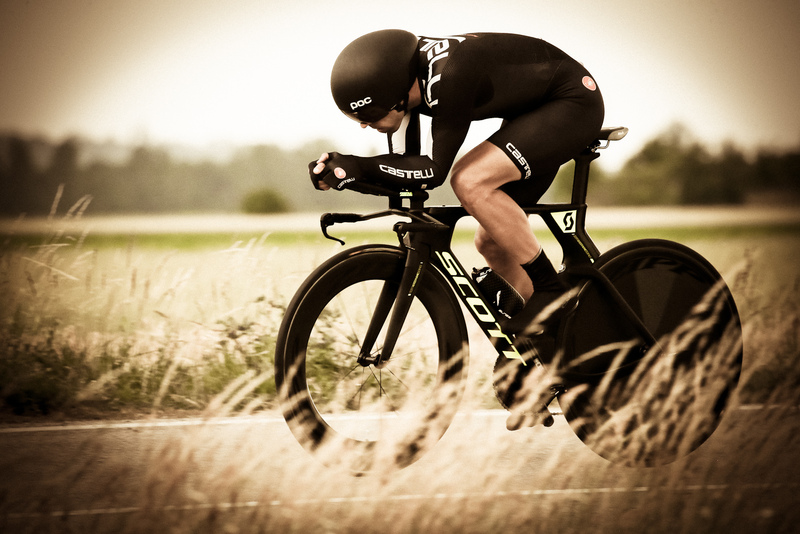 Thus, after optimizing the position on the bike, a modern time trial helmet, depending on the purchase price, has the greatest impact. 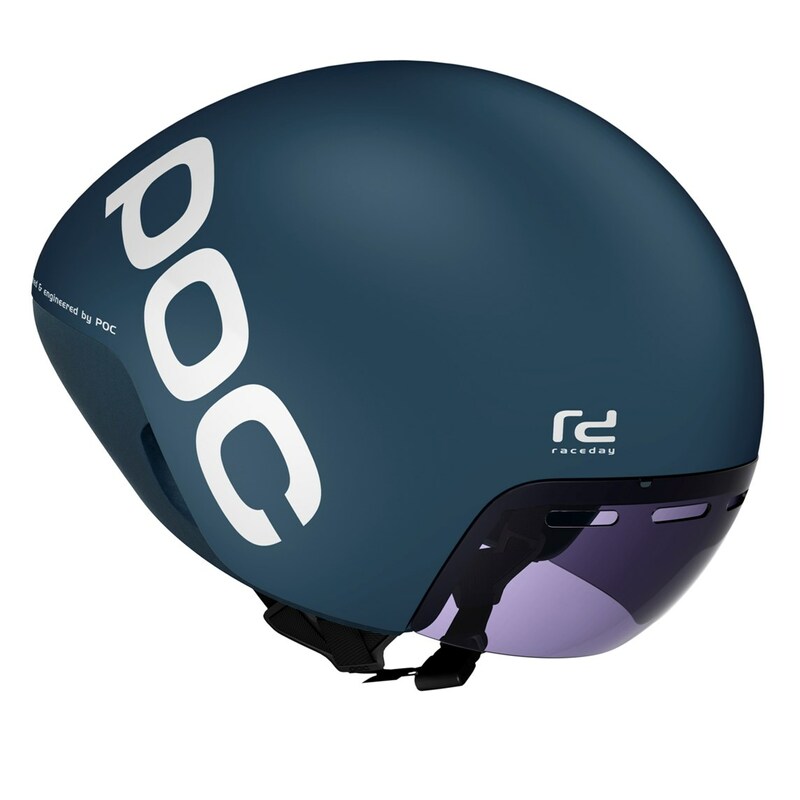 For a while the standard helmet was almost closed with a long tail back to a point, but now it's increasingly more common to encounter a round model with presumably better performance with their shorter drop shape. Numerous independent and proprietary wind tunnel tests with the most peculiar results add to the confusion as to which helmet is really the fastest on the planet? Our answer: it depends. Depending on head position, back form and sitting position, an aero helmet with longer tail is the best and fastest variant like before. If the individual elements are adjusted, but not optimized to each other, or the athlete lowers his head too often, the design has a negative impact. If you don't maintain a perfect position over the rounds during the competition or if you are not compatible from a bike fit perspective, then you are better advised to have a shorter model. Wind tunnels are tools for measuring designs and comparing the results with each other. 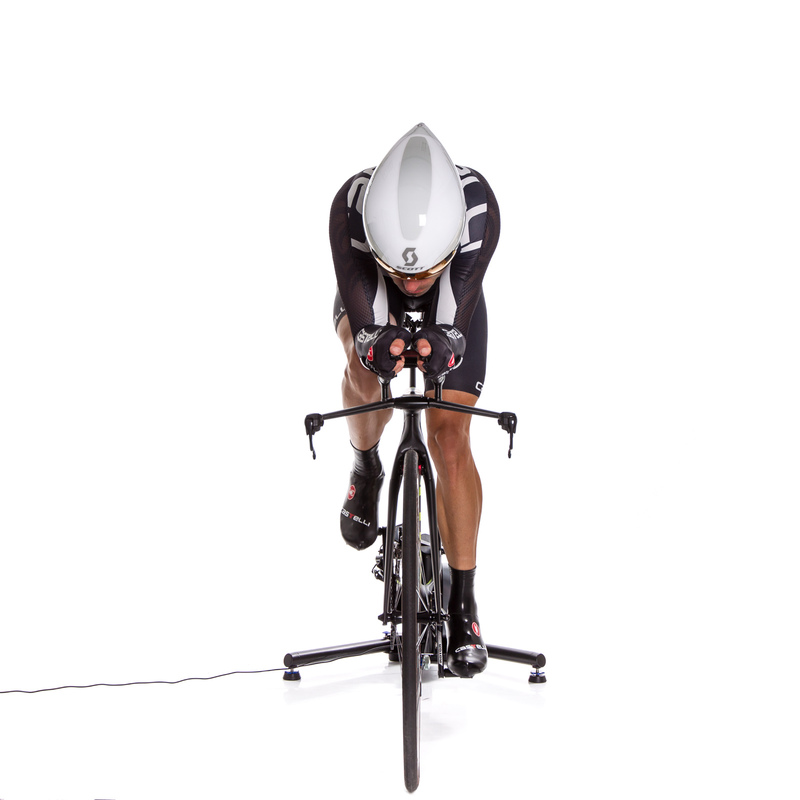 There is also the option of tweaking the test setup until the results come out as desired. 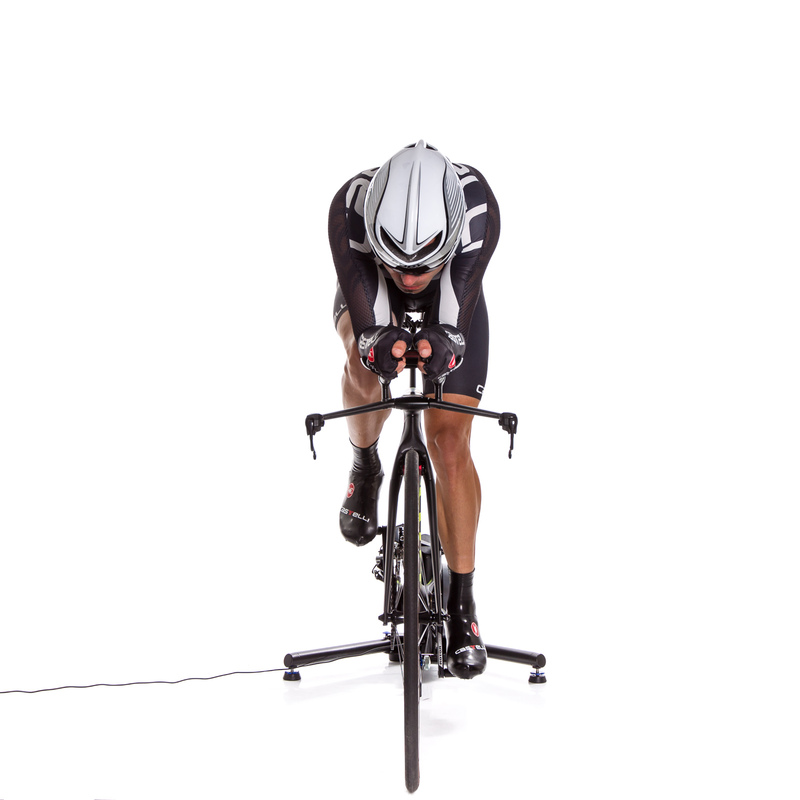 With this reality, the results gained have little meaning because the athletes never have wind this consistent or have this much stability when going up and down hills, with, against and across the wind like it is played out in the tunnel. Plus, fatigue, pain and frustration impact focus regardless of conditions. 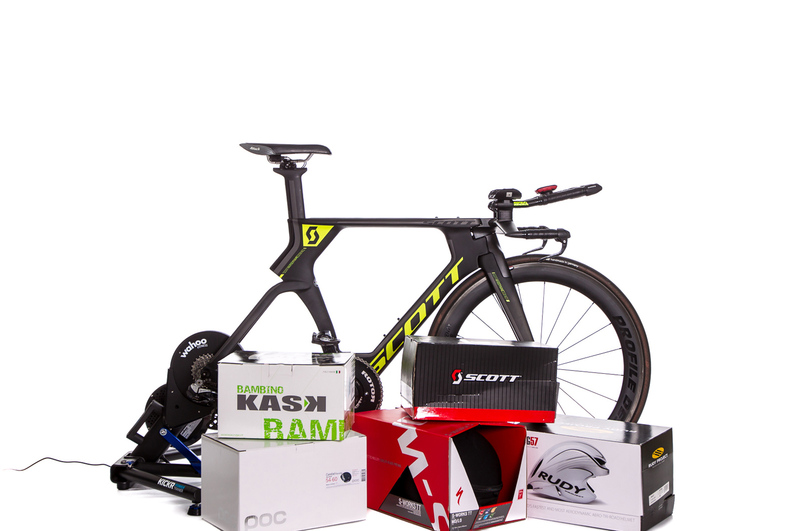 This english translation is dedicated to Sebastiaan Brouwer, mechanic at Probike La Santa, Lanzarote. 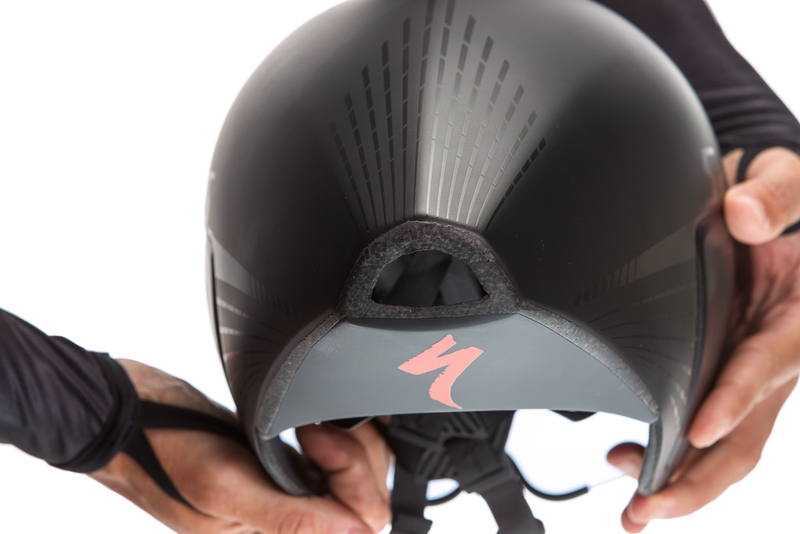 The helmets individual construction paired with a realistic riding position, followed with the predominant intended usage determine the optimal helmet. Models with smooth, specially shaped surfaces and sparse ventilation openings reduce air swirls and allow airflow to pass by cleanly. 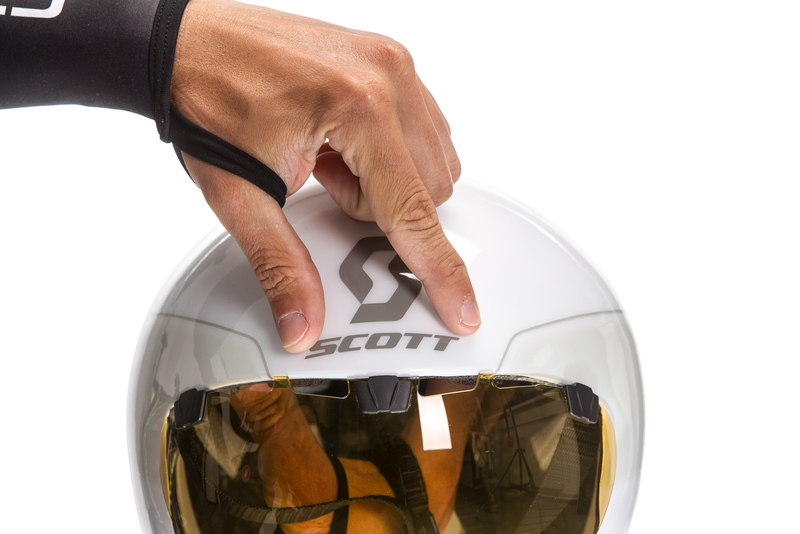 The best aerodynamics are offered by closed helmets with integrated visor, with ends that extend far back and that lay between the shoulder blades on the back. However, if the rider cannot hold their body in the optimal position (dropping, turning head, etc. 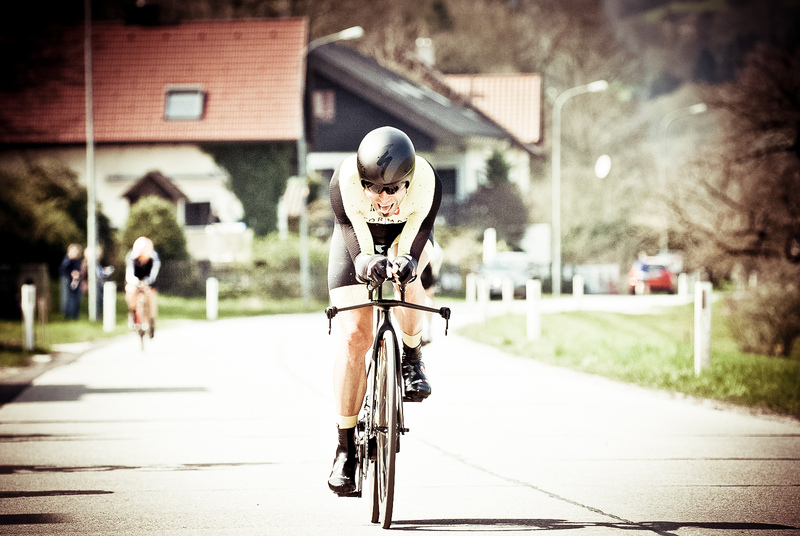 ), long, sustained high crosswinds or high temperatures nullify the time advantages gained. 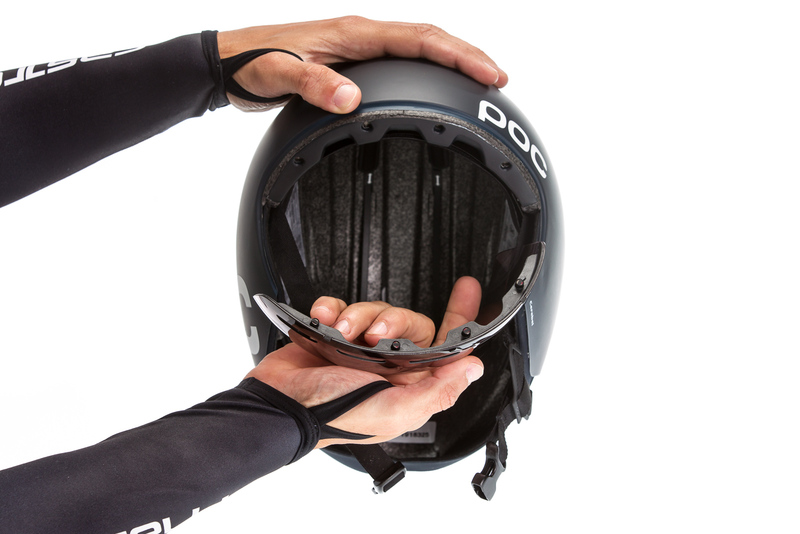 Helmets with shorter drop or ball shapes allow more movement freedom and can be combined with almost any back form and seat position. 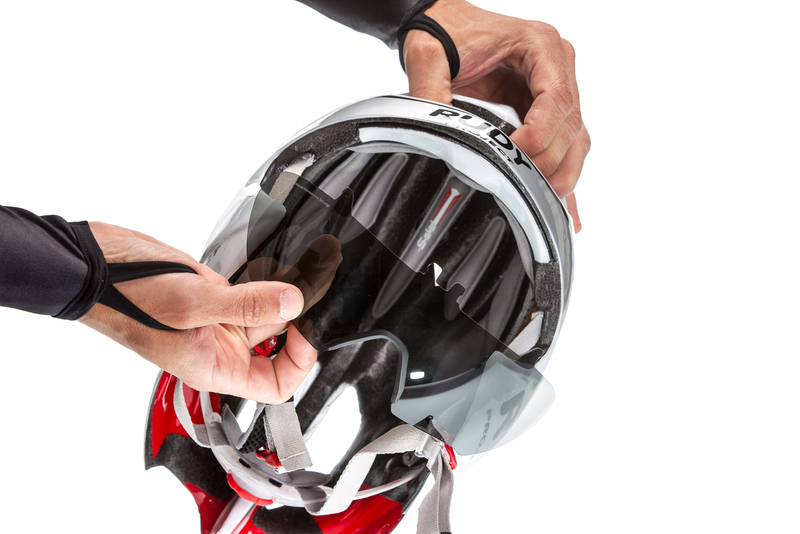 Aside from form, appearance and protection, the criteria of fit/adjustment, ventilation and visor should also be taken into account. Having tested so many riders now (over 500) I can usually predict which two or three helmets will work for those riders depending what position they are in. Based upon their needs and preferences we are then able to confirm with comparisons which product works best for them. 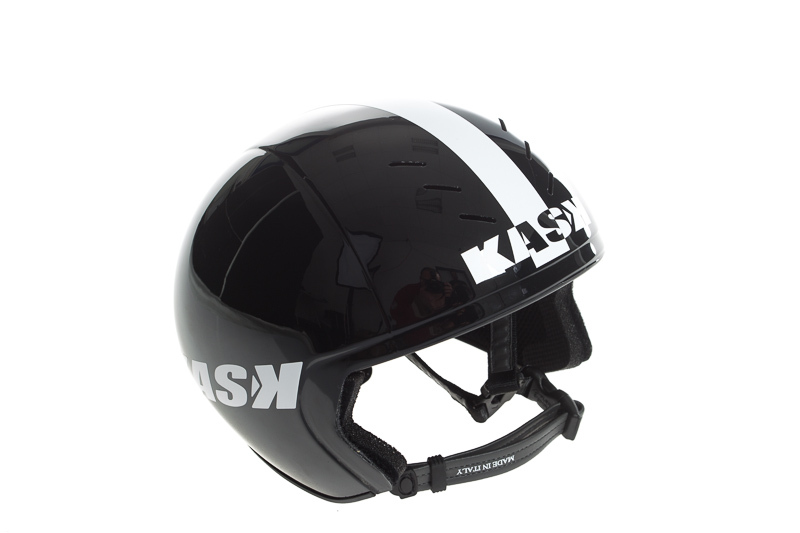 Although it's been available in stores since 2013, the Kask Bambino is still a classic and remains the choice of professionals on Team Sky. 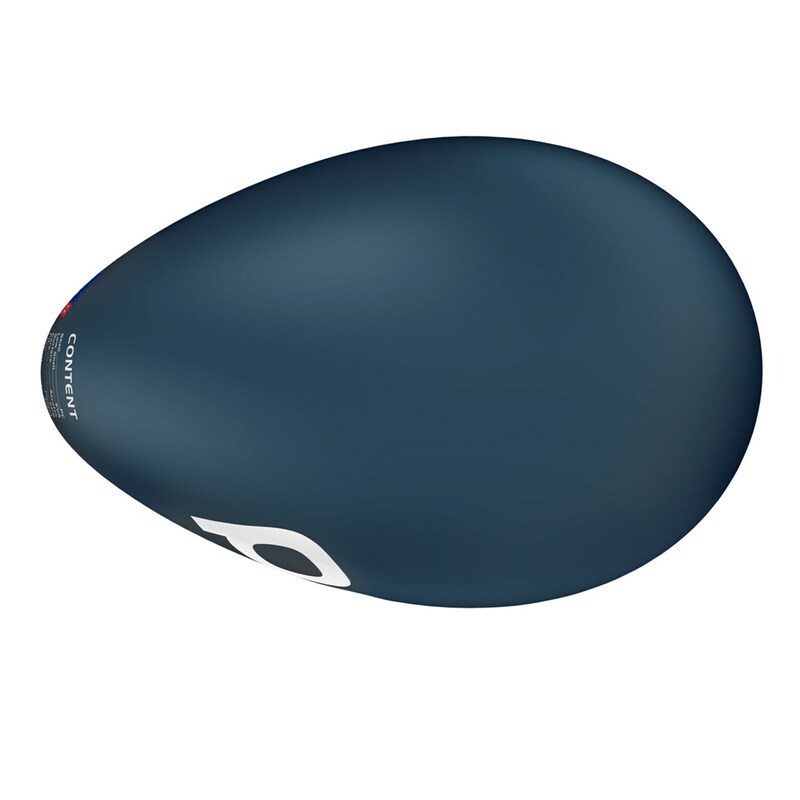 Its round drop shape should ensure high aerodynamics with continued airflow in most head positions and in almost all wind conditions. 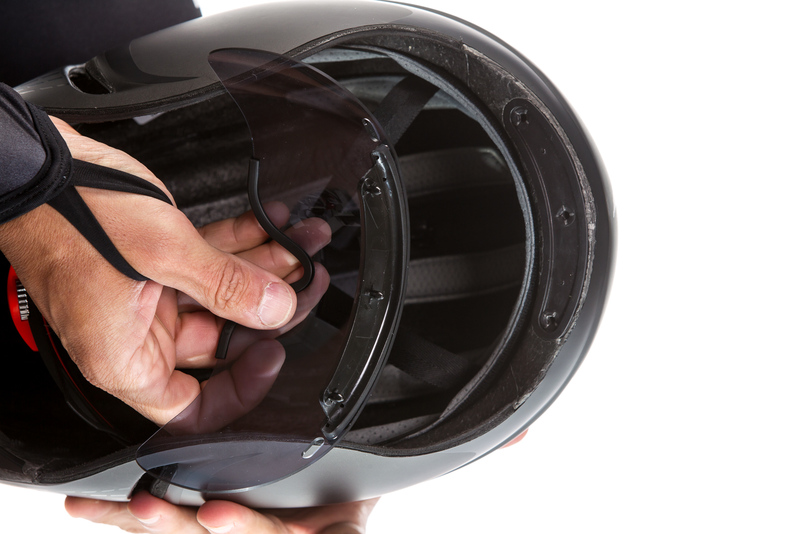 The magnetic attachable visors are available in different shades and can be secured in place automatically with magnets that are integrated into the helmet. 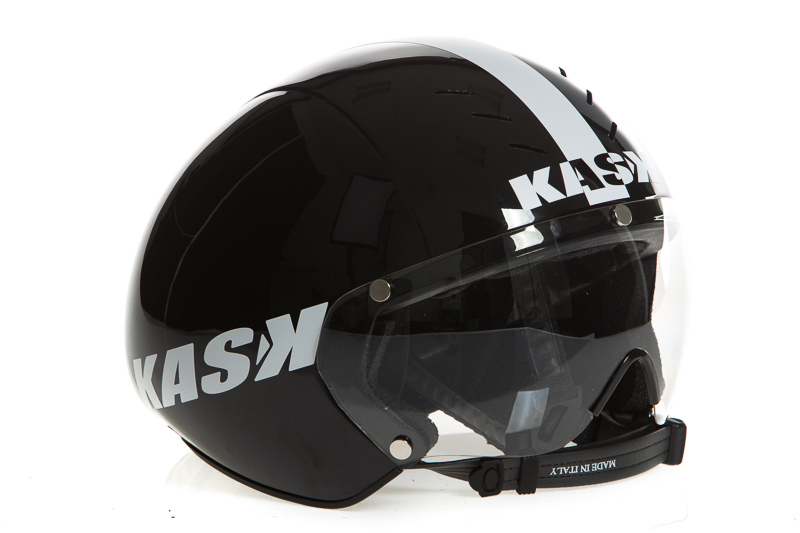 Experiences: Its biggest plus point - the visor with innovative mounting and large range of view is also its greatest drawback. 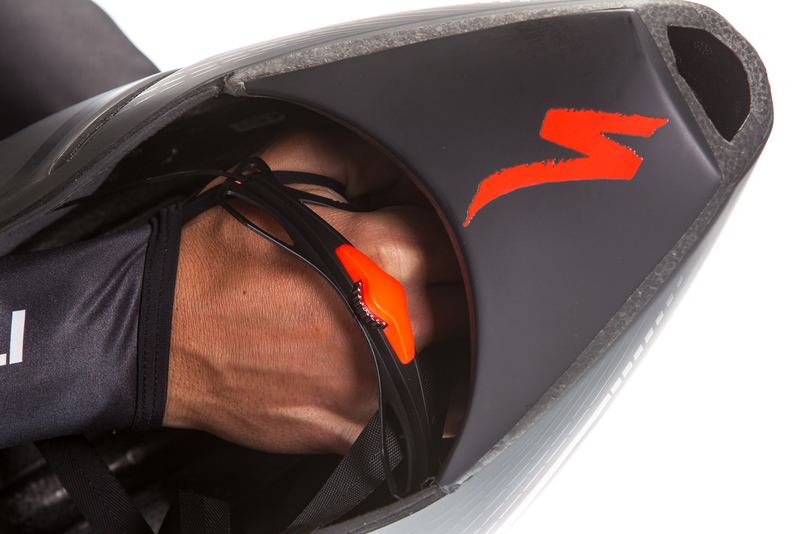 On the one hand, the strong magnets release over time from the visor and it gets lost periodically; on the other hand, all visors are easily prone to steaming up in fog, rain or mist. 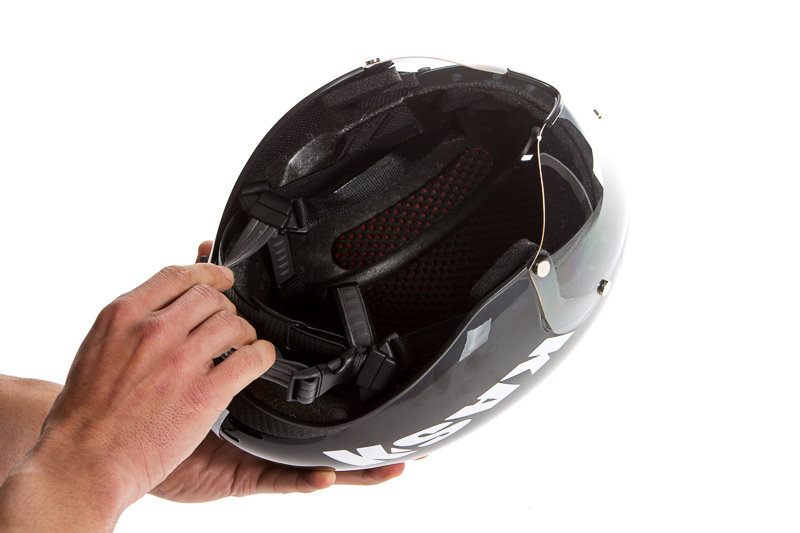 Fortunately, the visor can also be removed easily while riding and can be relocated easily to the surrounding vegetation. I've done this at least five times in two years and with one exception, it has always emerged again after the competition. 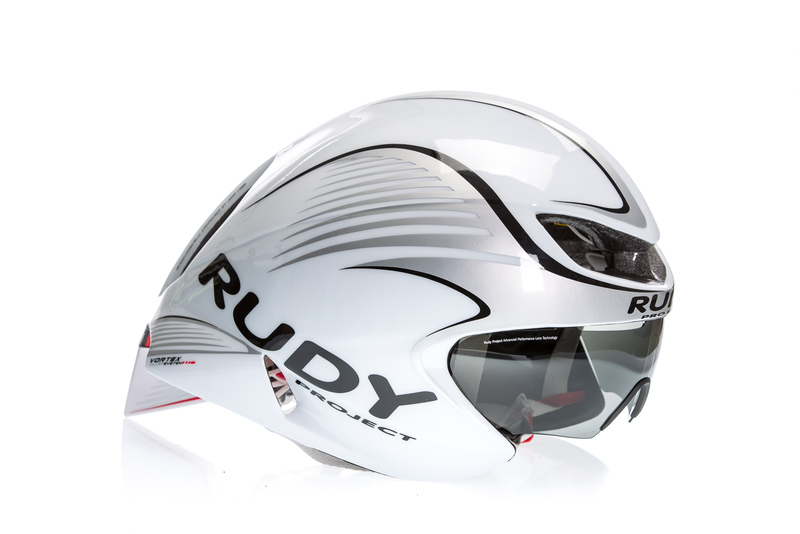 Summary: The Bambino fits my head perfectly and offers a stable fit without pushing on my brow or ears. 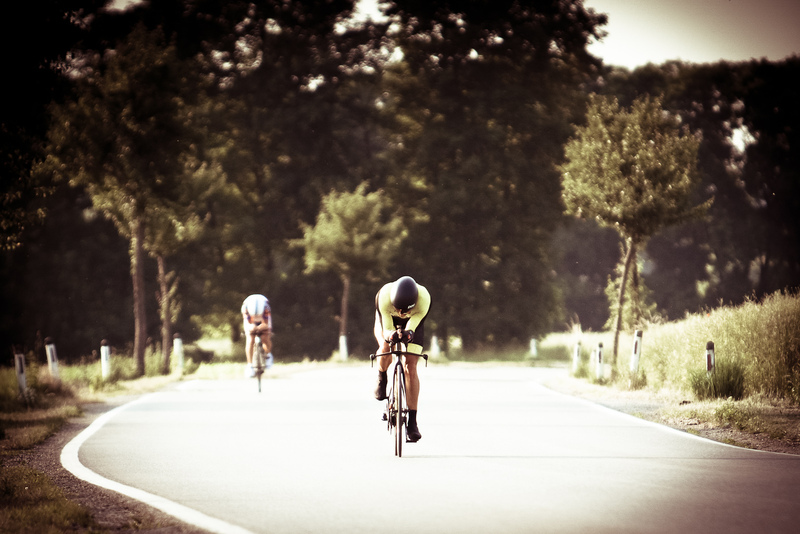 You can easily go the distance in temperatures up to 30 degrees, although a pair of glasses is recommended instead of the visor (even in rain). 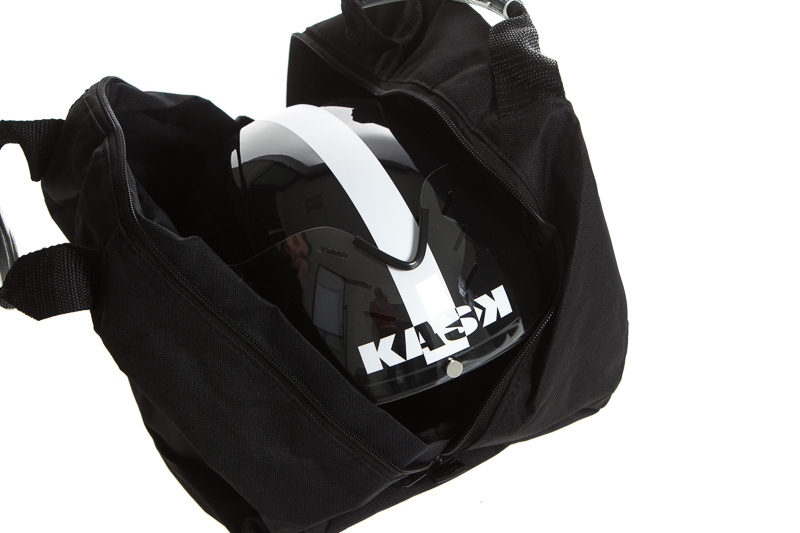 I recommend it for its workmanship and appearance as the most suitable for daily use. I have been very satisfied wearing it, often in training. Scott's time trial helmet arose from close collaboration between aerodynamic experts Simon Smart, who conducted CFD simulations and measurements in Mercedes' wind tunnel, and Lars Teutenberg (Scott Technical Race Support), who spent a lot of time with testing and fine tuning. 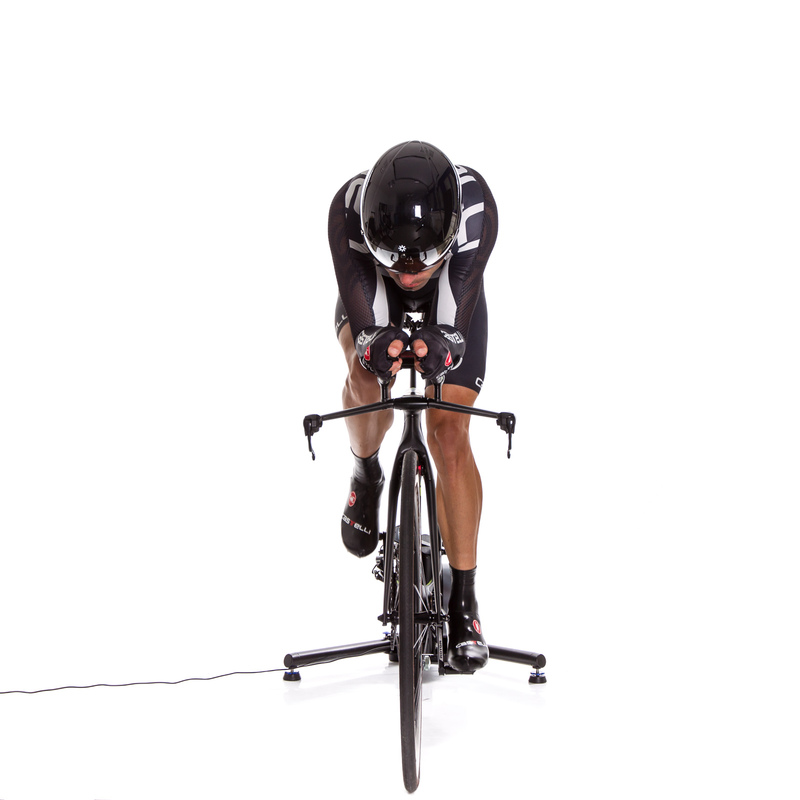 In addition to the fit and cooling, the focus was on optimal aerodynamics in "realistic" sitting positions. 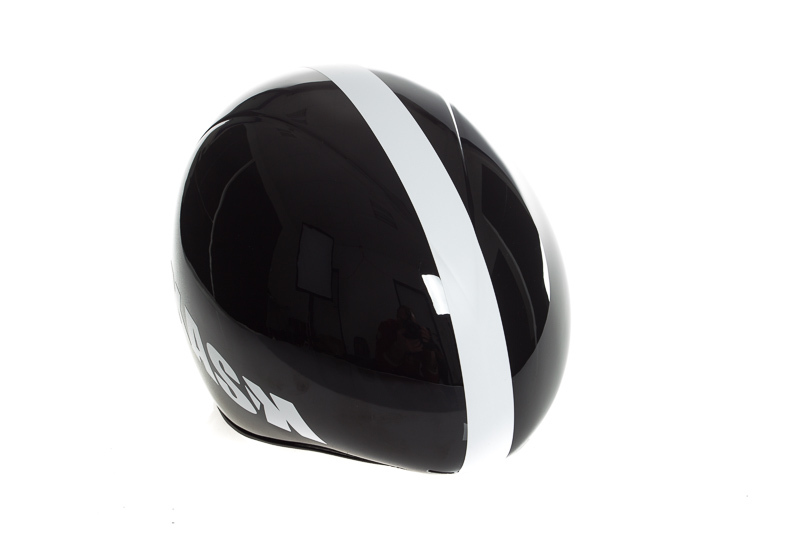 The results were a medium length helmet - as the best compromise between performance and usability in race situations - as well as a properly functioning ventilation system with openings on the visor, a wind channel in the inside of the helmet and a large outlet at the back. The Scott Split is worn by many professional cyclists and triathletes, most notably the Orica Greenedge Team and the incumbent Ironman World Champion, Sebastian Kienle. 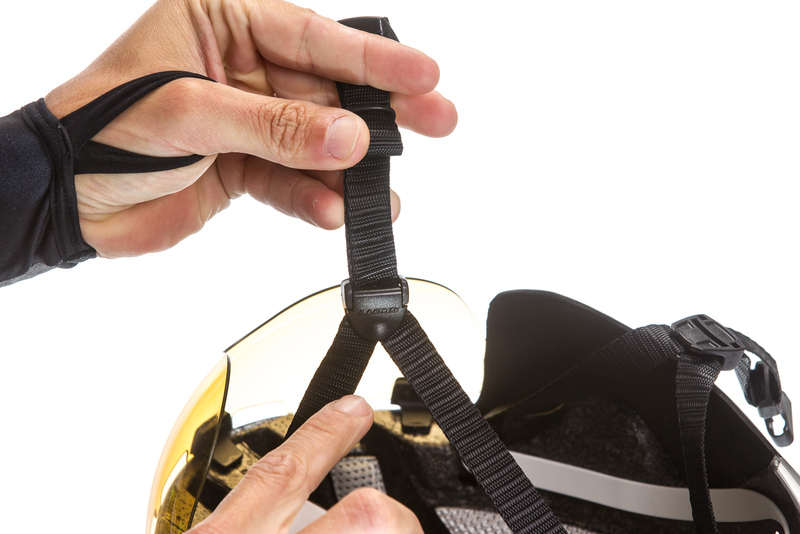 The visors come in three colors and two sizes, but must be purchased separately, dropping the helmet in comparison in terms of purchase price. 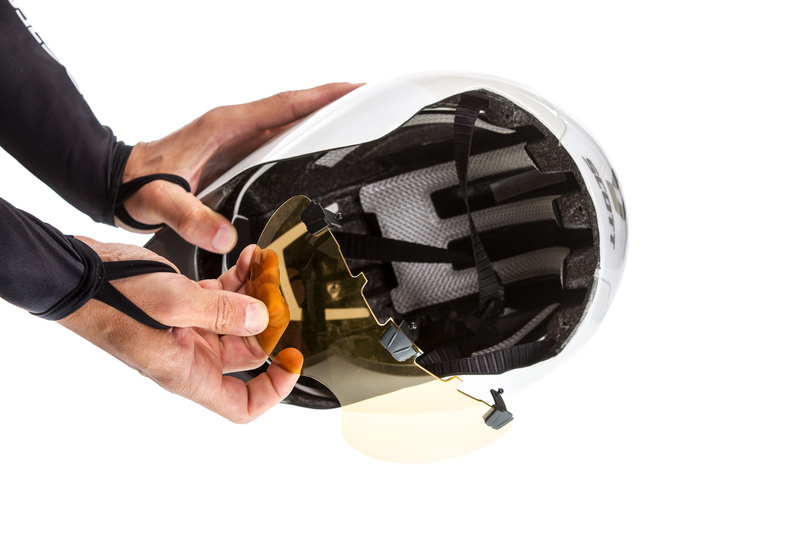 Experiences: The stiff outer shell of the helmet is very sturdy and provides high safety, but complicates positioning in the ear area. 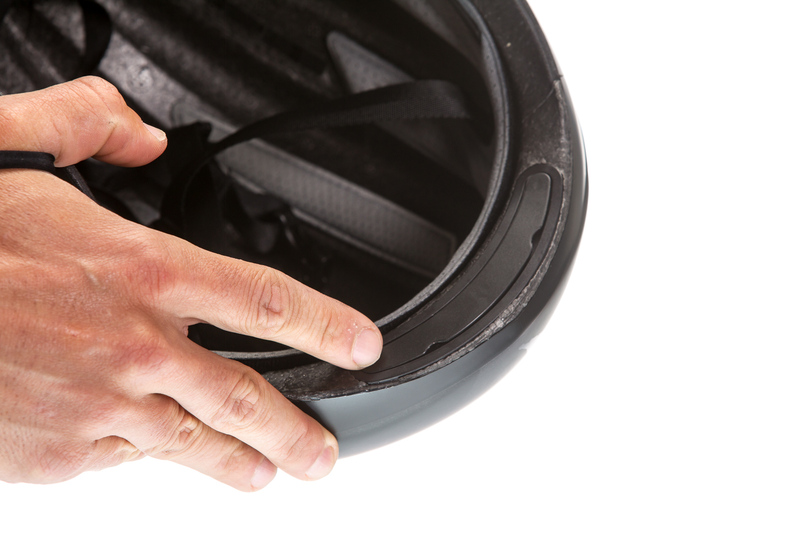 A precise fit on the back of the head can be had at any time using the classic belt system and an ergonomically shaped wheel (MRAS), even once the helmet is on your head. 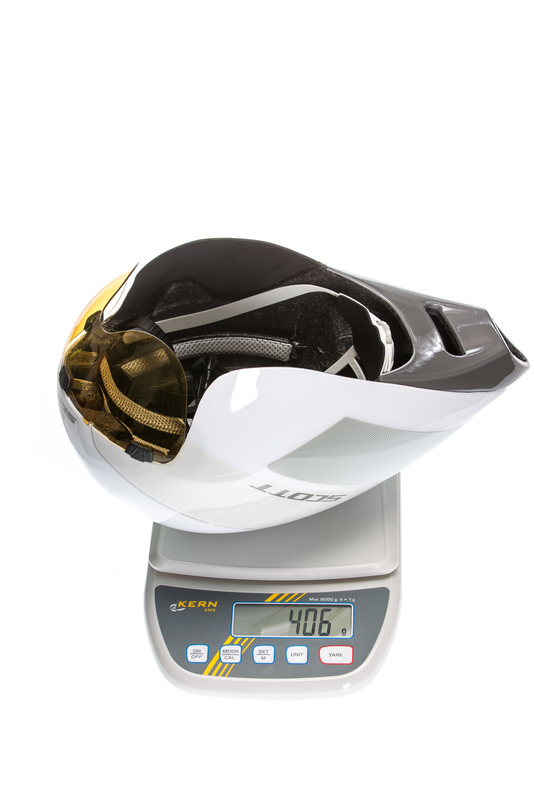 It provides a broad range of viewwith and without a visor and can be combined well with sunglasses. Summary: hip on the outside, old school on the inside, The Split offers good comfort and positioning, like you are used to from a classic bike helmet. 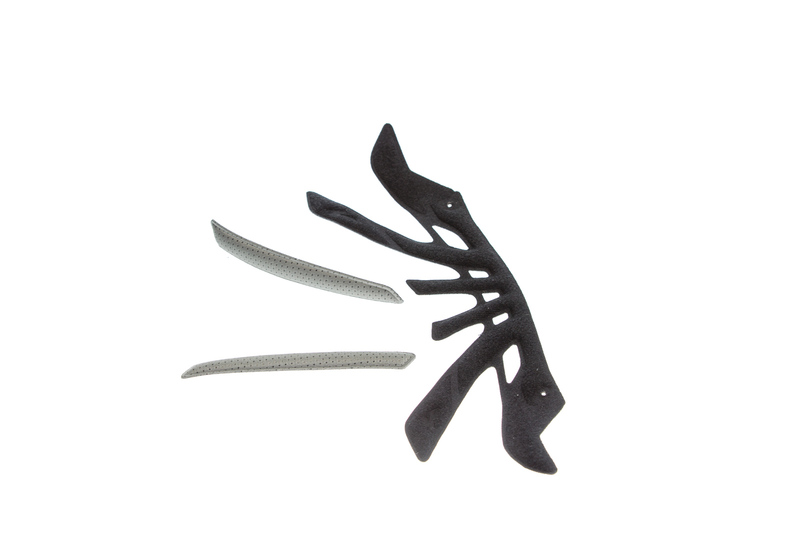 Its shape allows for very low positions with widely drawn shoulders without slipping. 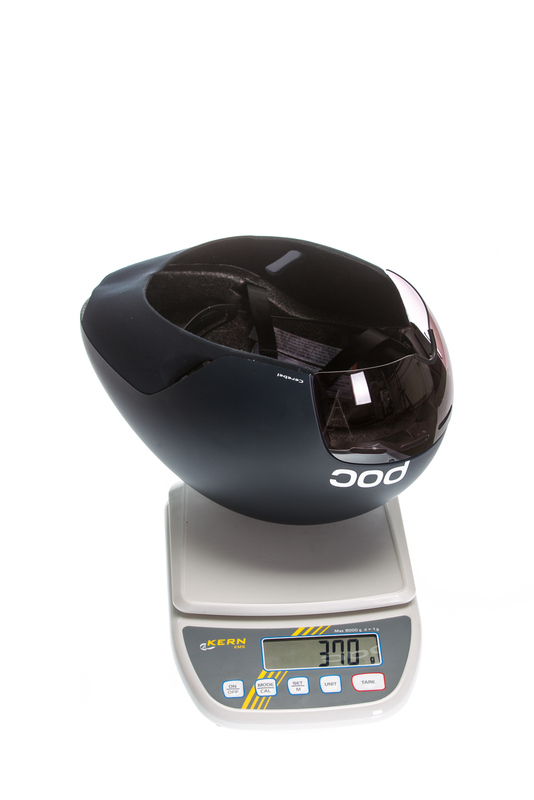 The weight is acceptable for a helmet of this size and the cooling functions even at lower speeds. 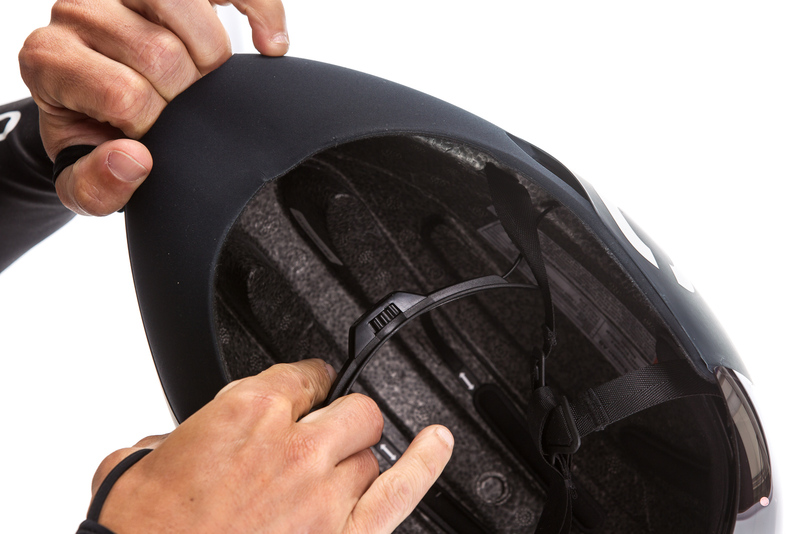 At high temperatures (cooling), even in rain and fog, sunglasses are recommended because an attached visor cannot be removed with one hand while riding. 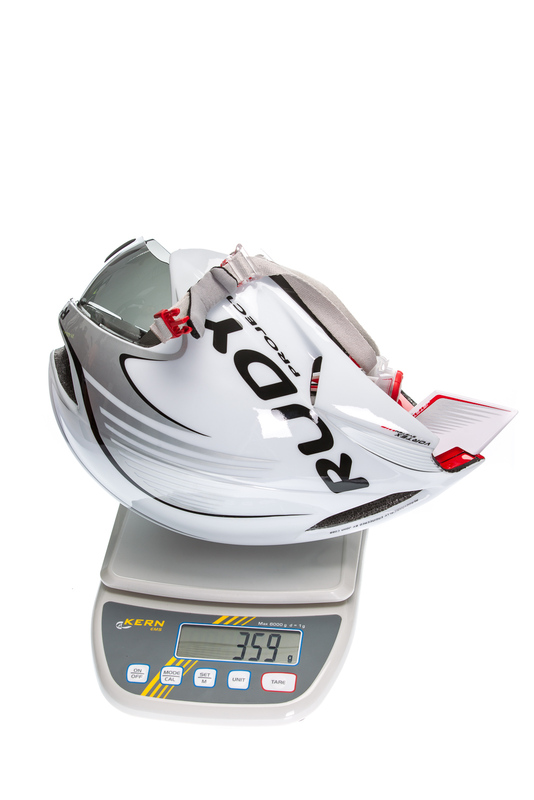 In general, a helmet for high speeds and steady heads. 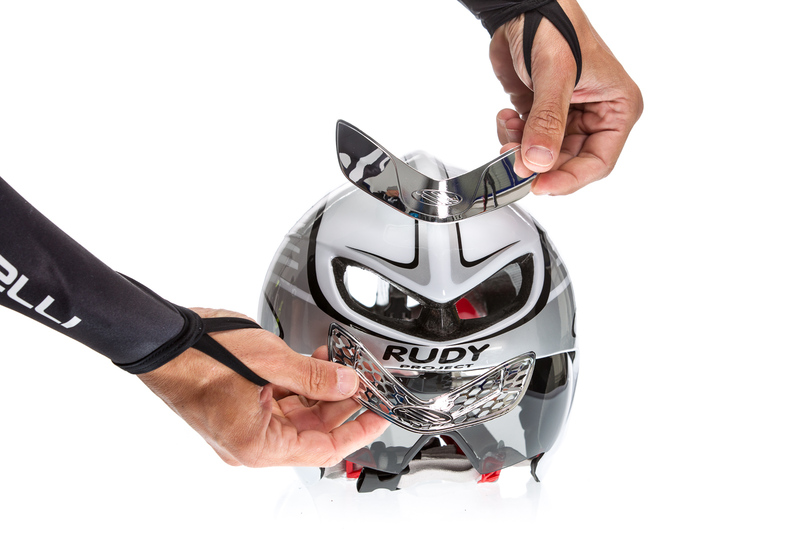 The successor of the legendary Rudy Project Wingspan (2011 and 2012 most worn helmet in Kona) was further developed with the help of aerodynamic expert John Cobb. It was tested in the wind tunnel and has numerous patented features. 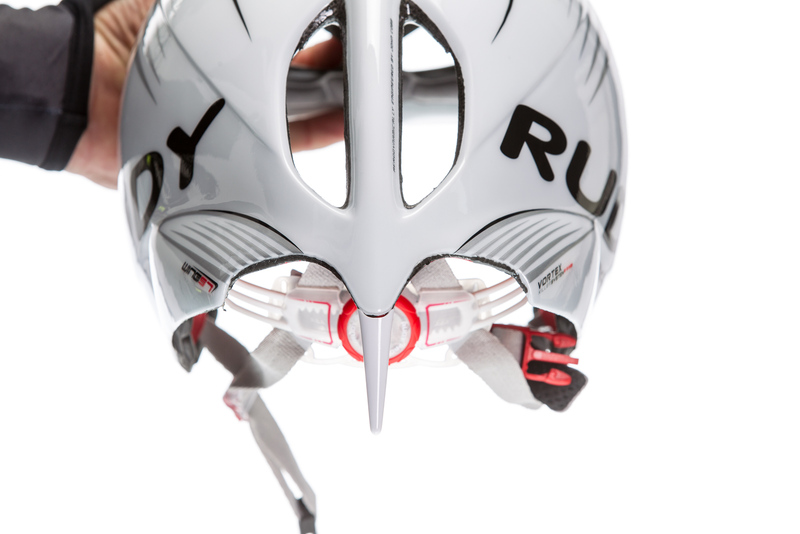 Aside from its unusual geometry, which should be ideal for most positions on timed rides and triathlons, it features a fully integrated and removable visor; exchangeable vent covers (open, mesh, closed) as well as a removable magnetic jet stream. 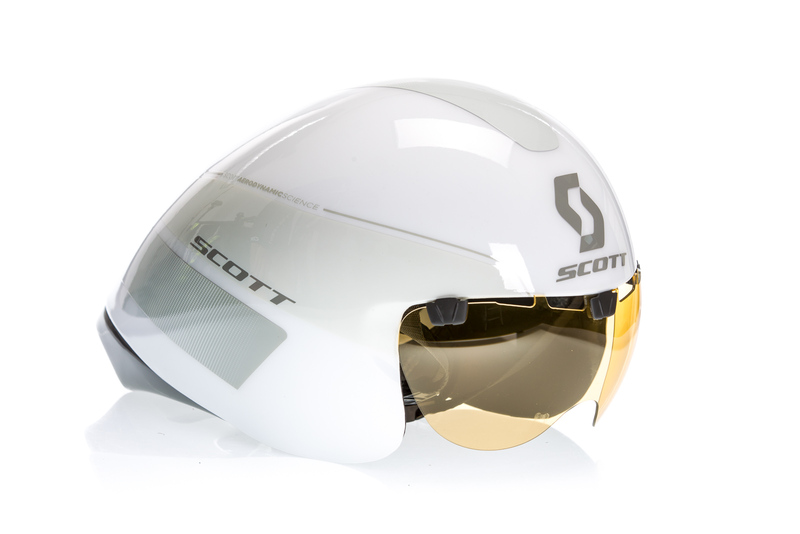 Experiences: The light helmet has a visor that can easily be clicked on, its noted for its sleek appearance and is available in bright colors. In the ear area, the helmet shell is somewhat flexible, which is good because it was relatively tight on me at this point and pressed a little. Otherwise, its pads and soft belts were comfortable and allowed for a perfect fit. 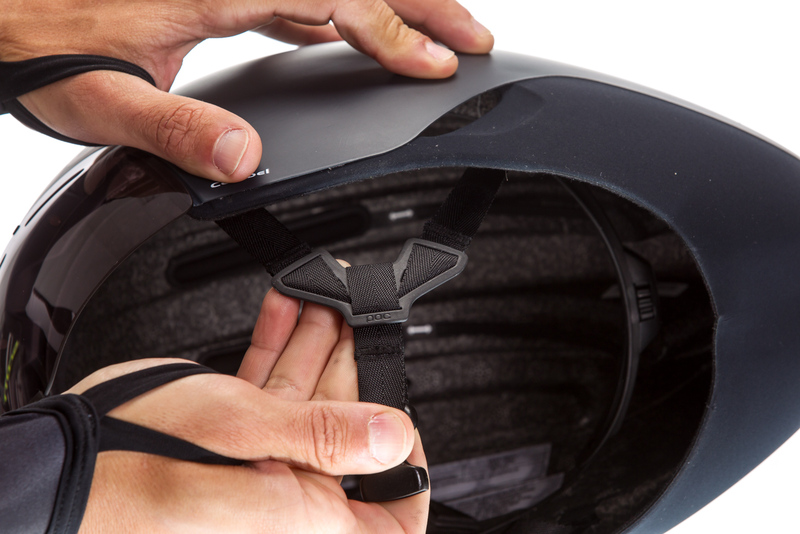 The helmet and visor offer a large view range for low positions. 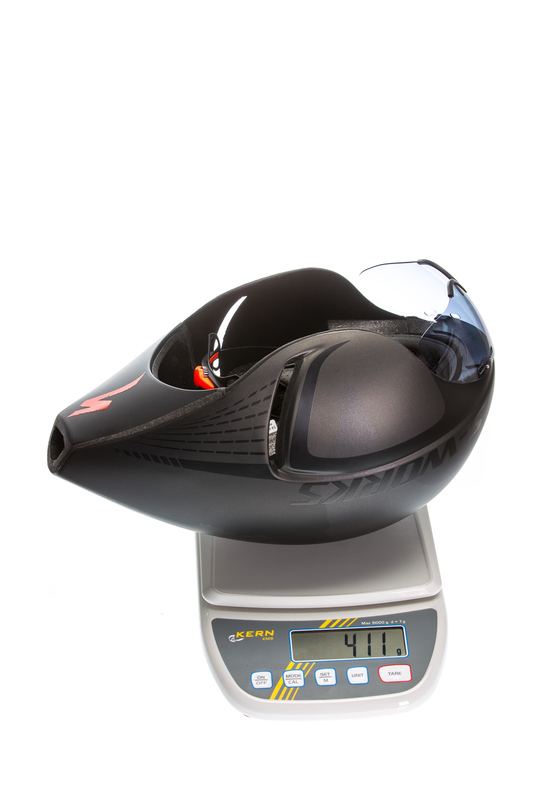 Summary: The Wing57 has been extensively developed in comparison to its predecessors both in fit and design. 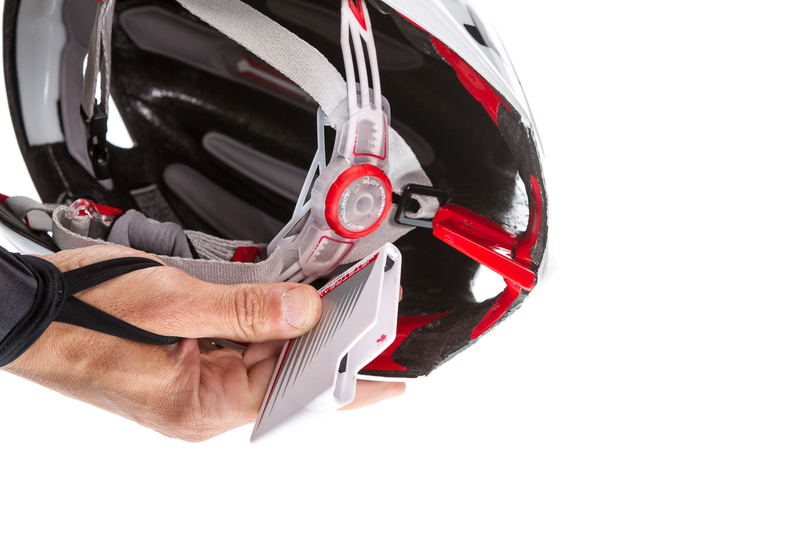 Its protective visor does a good job of blocking UV rays. 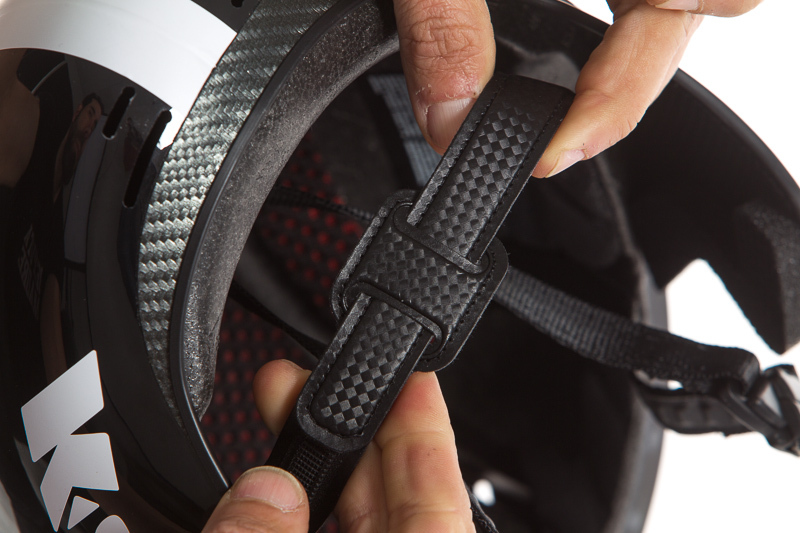 Its four studs, which are firmly mounted in the helmet, unfortunately, make it a little fragile. Our tester already broke one of these studs, but it didn't impact the functionality in any way. 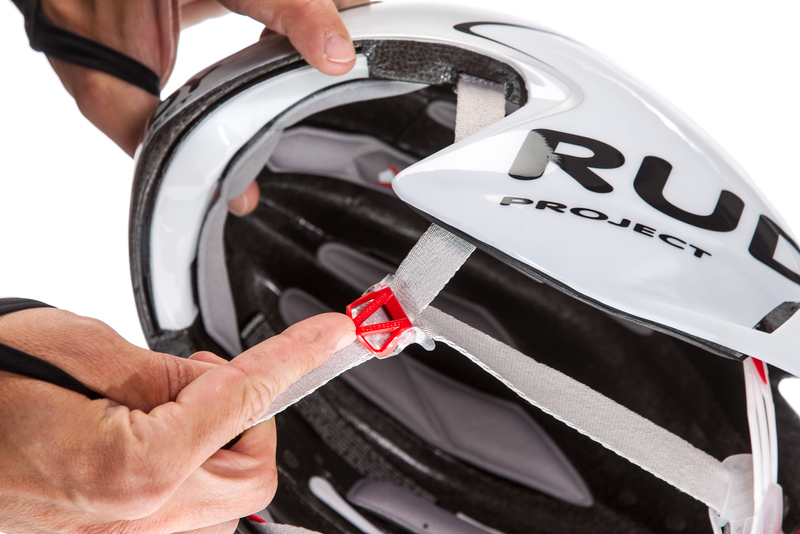 In addition, it cannot be easily removed while riding. In contrast, the ventilation is adjusted via vent covers and is exceptional. Whether or not the jet stream placement impacts the aerodynamics regardless of back and shoulder position of the athlete could neither be confirmed nor denied, but it is a great player. 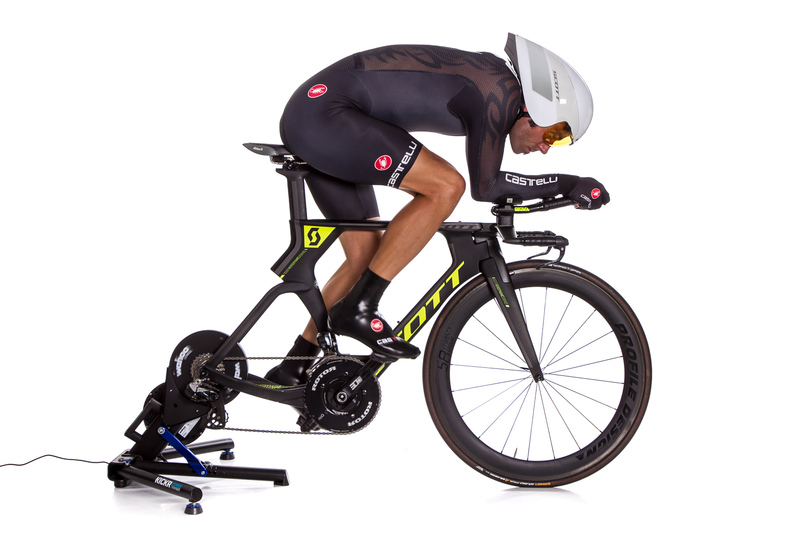 Tony Martins S-Works TT 4 is the successor of the 2012 previously introduced TT 3 and was redeveloped with the McLaren per CFD (Computation Fluid Dynamics) and in the wind tunnel. His new design is somewhat shorter and narrower and is thus best suited for athletes who sit more stable on the bike. It does meet the strictest safety standards, which is not a claim that all aero helmets can make. 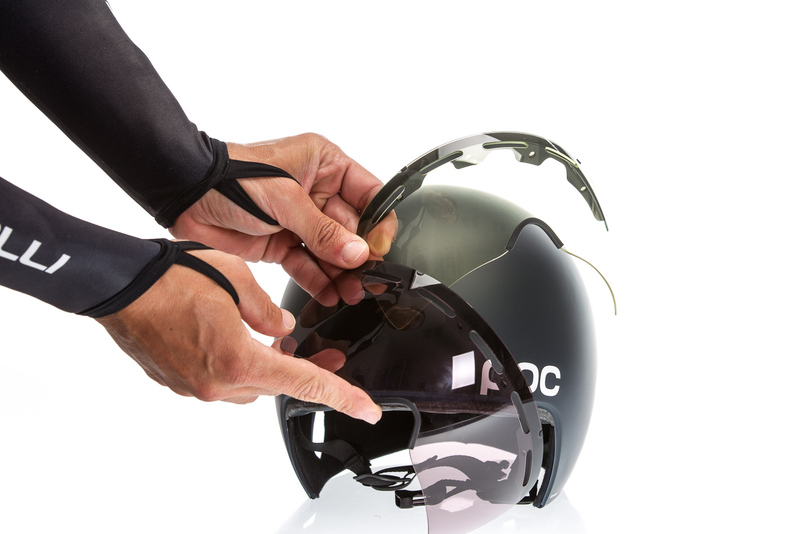 Although the helmet was optimized for combination with biking glasses, it comes with two removable visors included, which should not take away from its aerodynamics. An innovative, side air inlet provides sufficient cooling and "clean" airflow with reduced air resistance. Experiences: The most advanced technology in noble design. 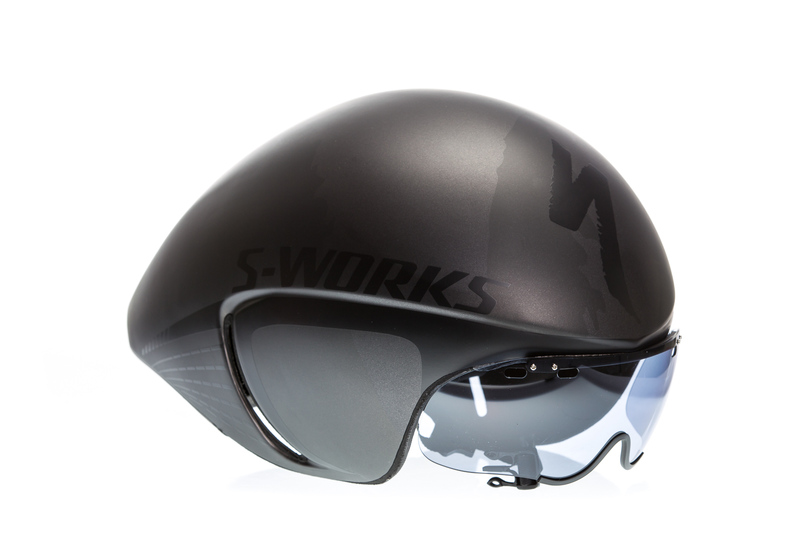 The S-Works TT 4 is a real looker despite its black-gray decals and comes with two visors, spare pads and a nicely padded helmet bag. 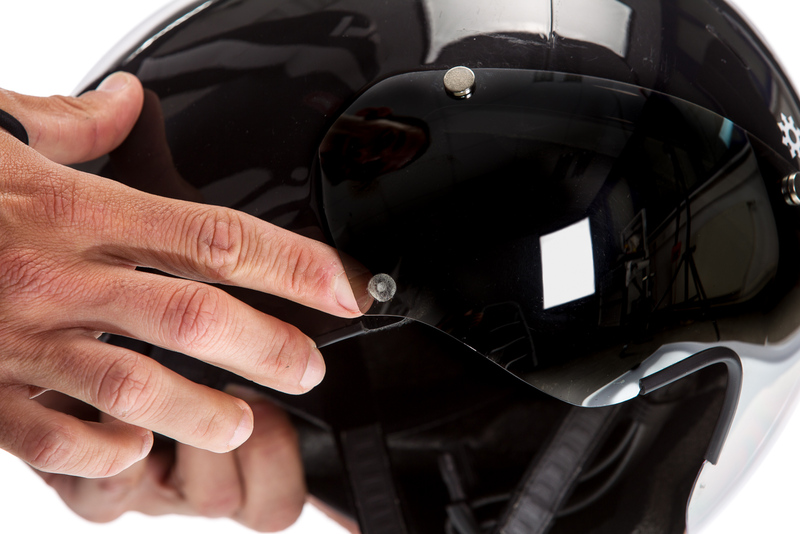 Placing the helmet on, particularly with the visor attached, should be practiced because you have to hold your head upright in order to slip into the narrow helmet. 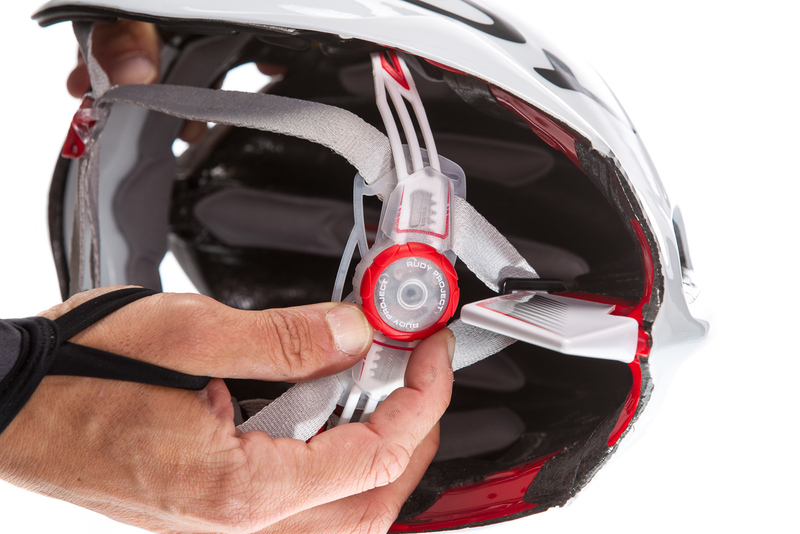 Once on your head, the helmet shines with comfort and very stable positioning. 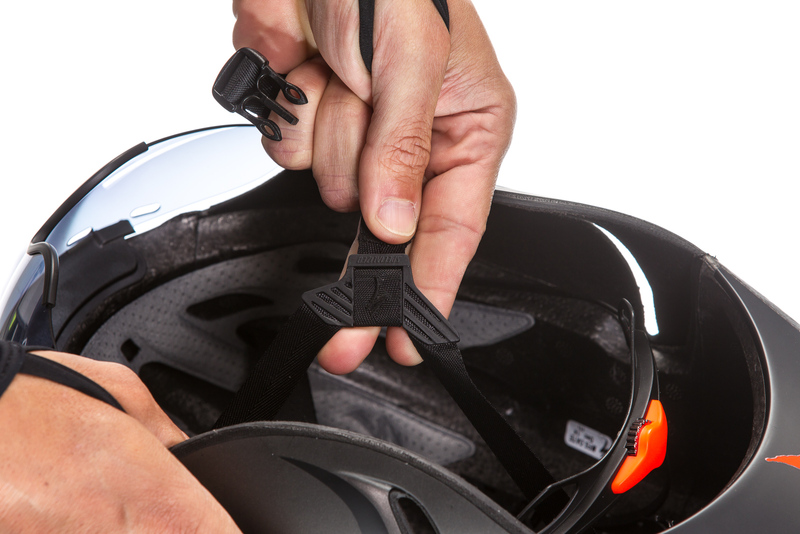 The retention system (mindset) has adjustable height with precision changes thanks to micro-ratcheting, even while wearing the helmet. 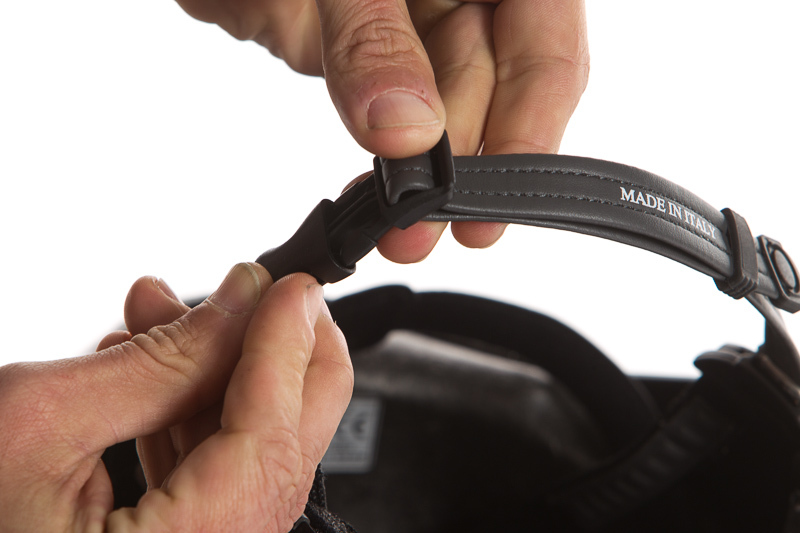 The soft, extension-resistant Tri-fix belts provide great comfort and a quick, even adjustment without fumbling. 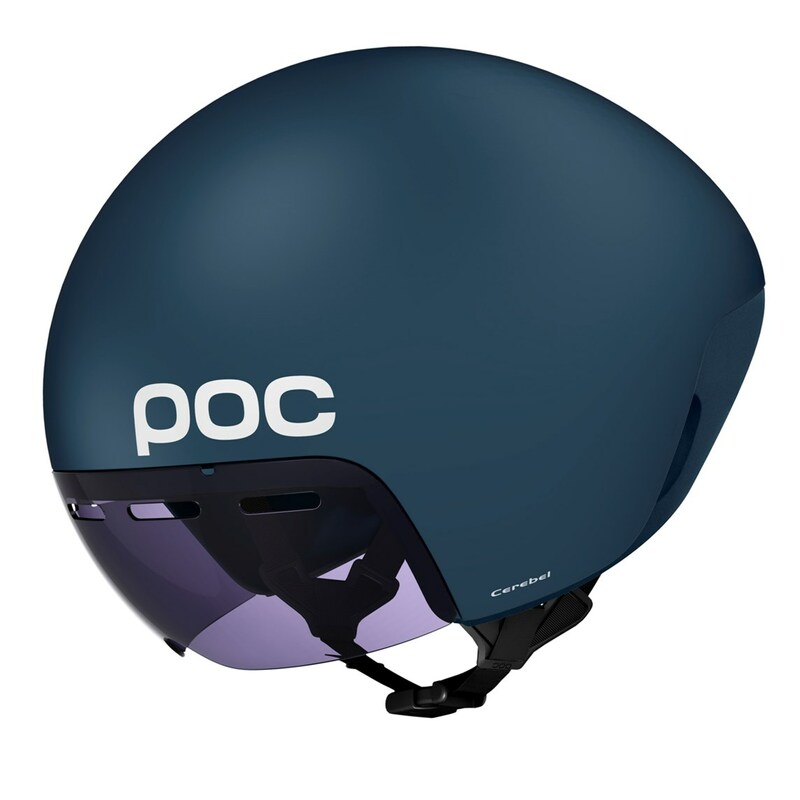 Summary: One of the most comfortable helmets that I know of, with excellent ventilation and brutal appearance. The visor did not personally win me over. On the one hand, its plug-in mechanism (particularly in my low seat position) greatly limited my view; on the other hand, it steamed up quickly (like most visors) in rain and fog. For my part, I prefer riding with the helmet with glasses. I think this setup is faster and that I profit from better cooling. 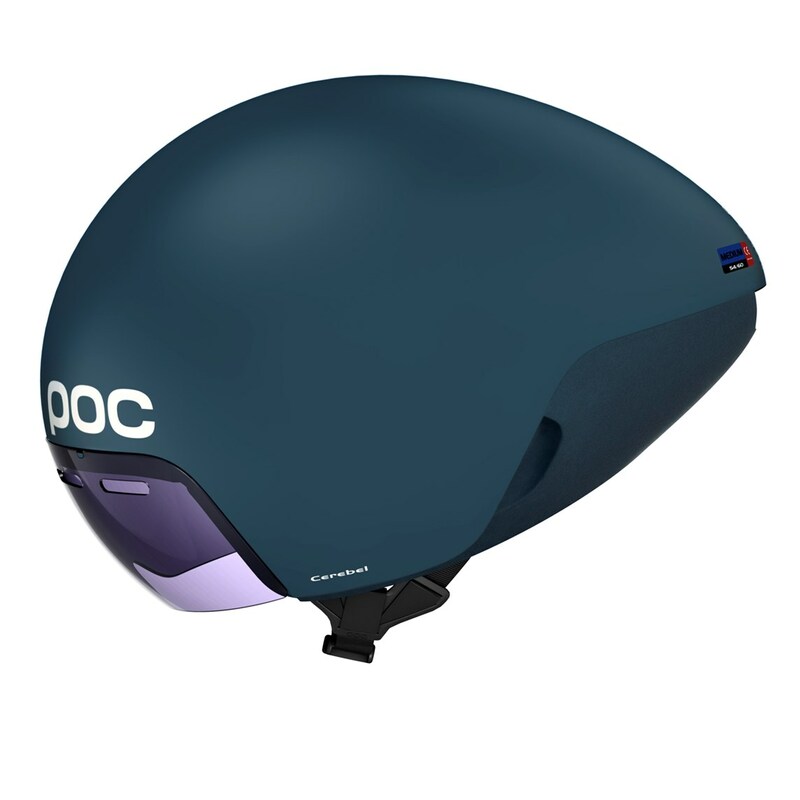 Tested extensively in the wind tunnel, the compact helmet should not only be convincing in static riding positions, but also for dynamic and changing body positions. 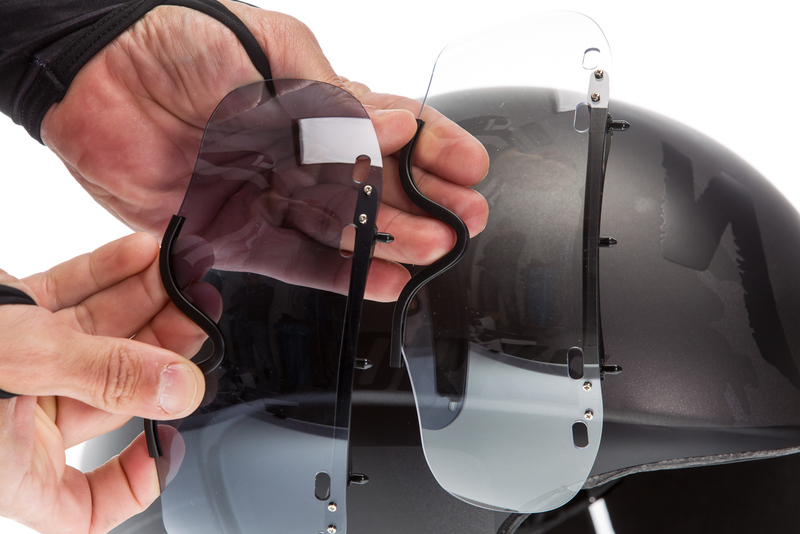 The colored visor from Zeiss is secured via a magnet system and guarantees safe hold and quick removal. 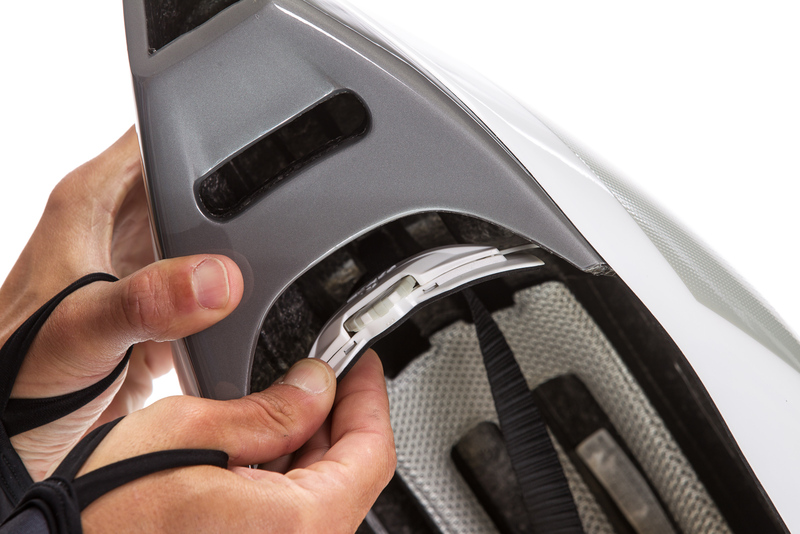 On the top of the visor, there are four air intake openings for sufficient ventilation and cooling. 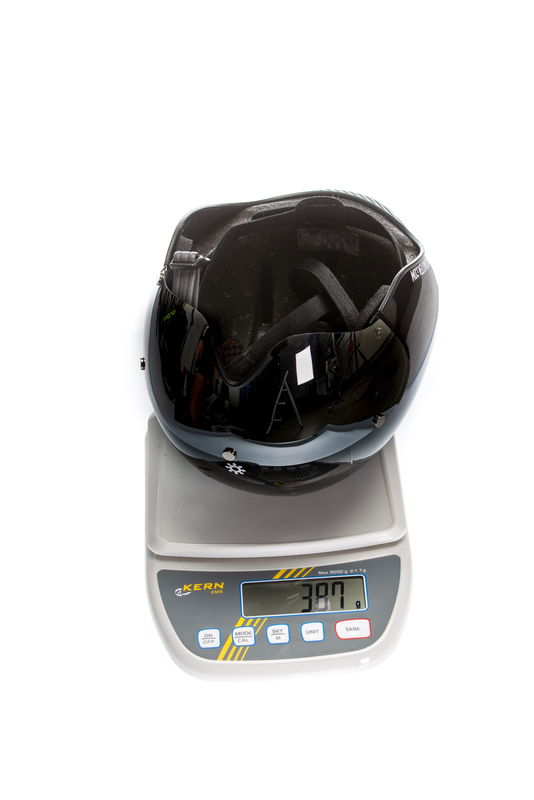 So that the helmet snuggles perfectly on the shoulder belt, the neck area consists of soft EVA (ethylene vinyl acetate), which is convincing as an aerodynamic material in providing better comfort and lower wind resistance. 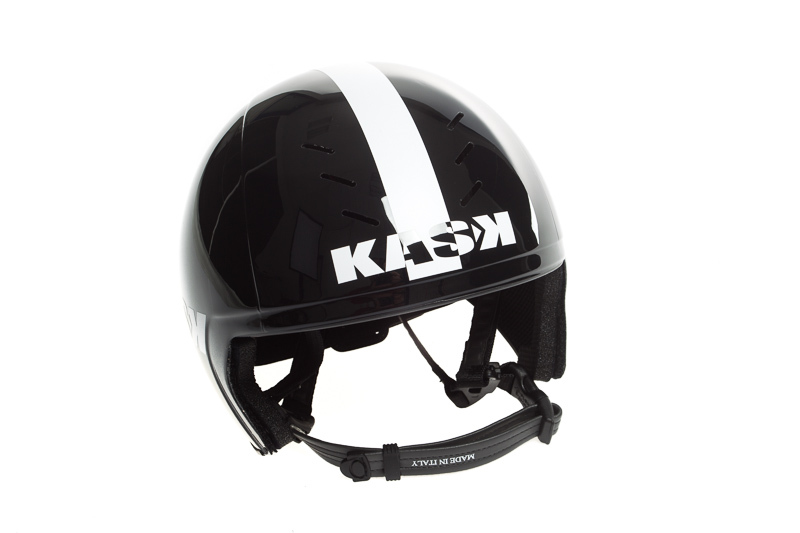 Experiences: The high quality aero helmet is reminiscent visually due to its shape and large, integrated visor of the Kask Bambino, but is superior in all aspects. 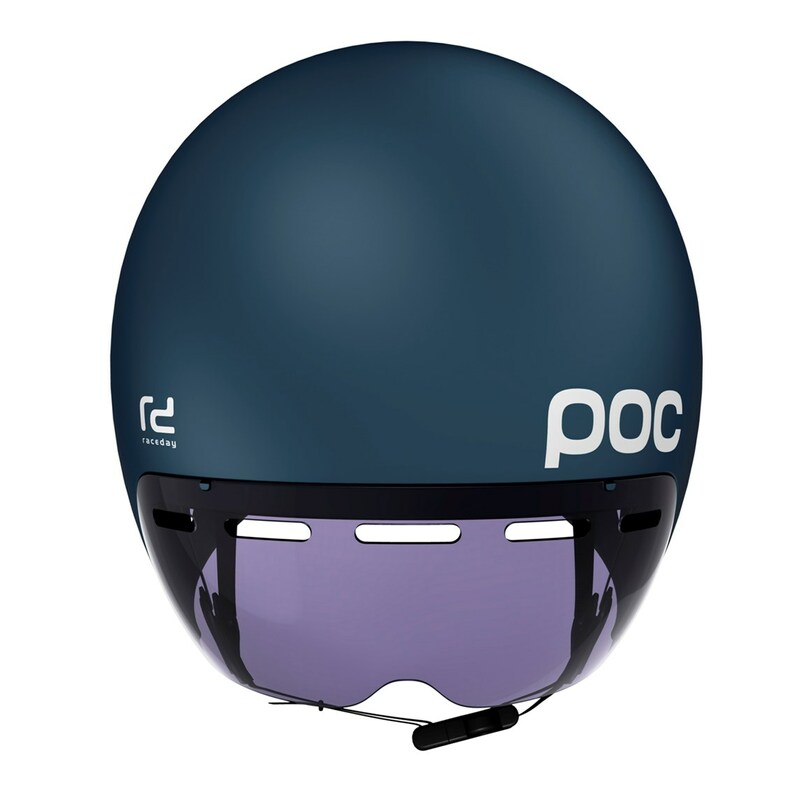 It is lighter, the head ring is adjustable in height and width, the soft neck area promises comfort, the shaded visor is well ventilated and offers a broad and contrast-rich view, and it can be cleaned streak-free without special cleaners. 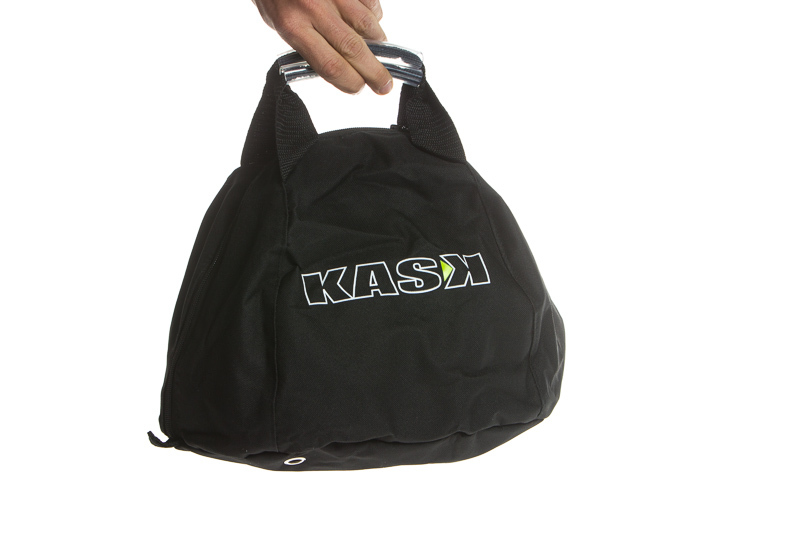 The magnet system provides for precise, correct positioning, low air-resistance and holds tight. Summary: The Cerebel is my absolute favorite not only due to its design and functionality, but primarily because it performs the best with my body position. 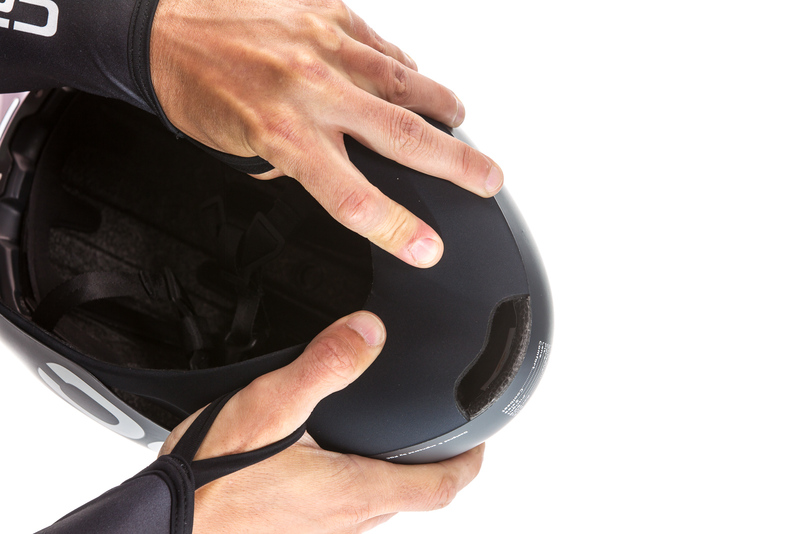 The soft EVA neck area fits perfectly on the back and ensures that the helmet always remains in the desired position, even if you bump it with your shoulders or neck. 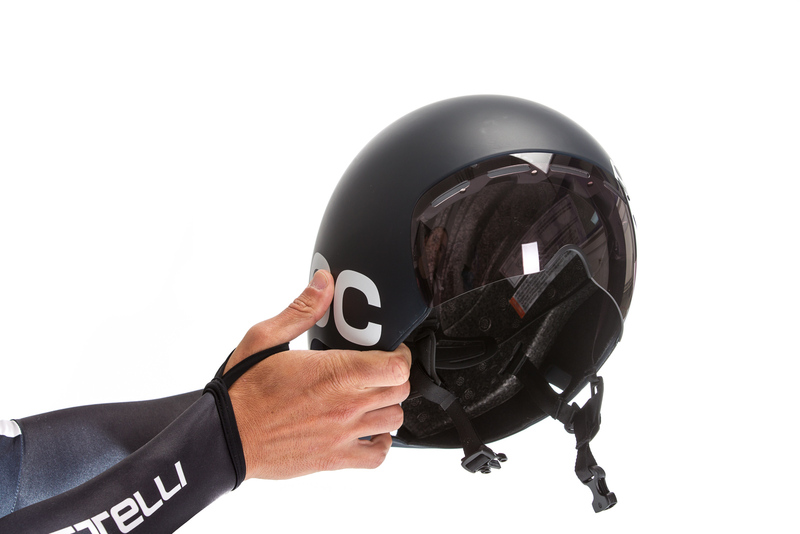 I ride often with the Cerebel with the visor, even in rain or fog. I have no fear of it fogging up because I can resolve this extremely quickly. The ventilation functions very well, even at 30 degrees and beyond. 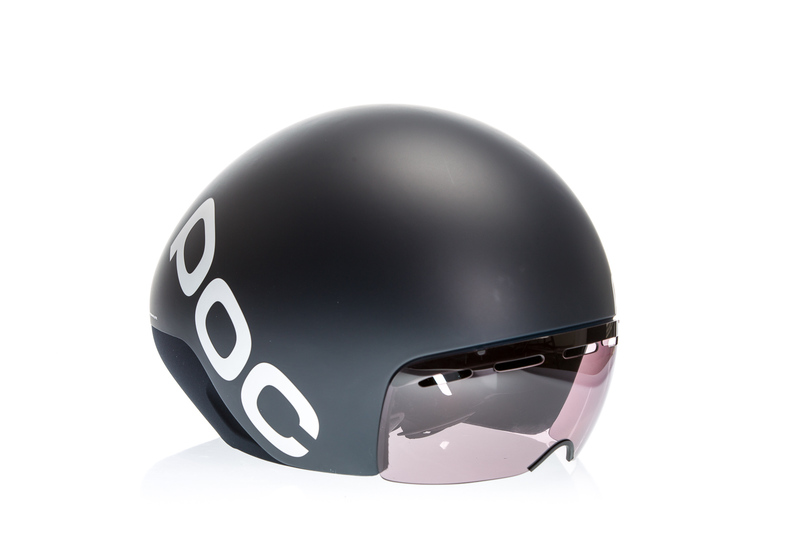 As an alternative, the helmet also is excellent when combined with biking glasses. A fine detail on the margin (perhaps only coincidence): If I lower my head too low or sub-optimally, the helmet whistles loudly on the side air inlets, causing me to automatically return to the aerodynamic position. 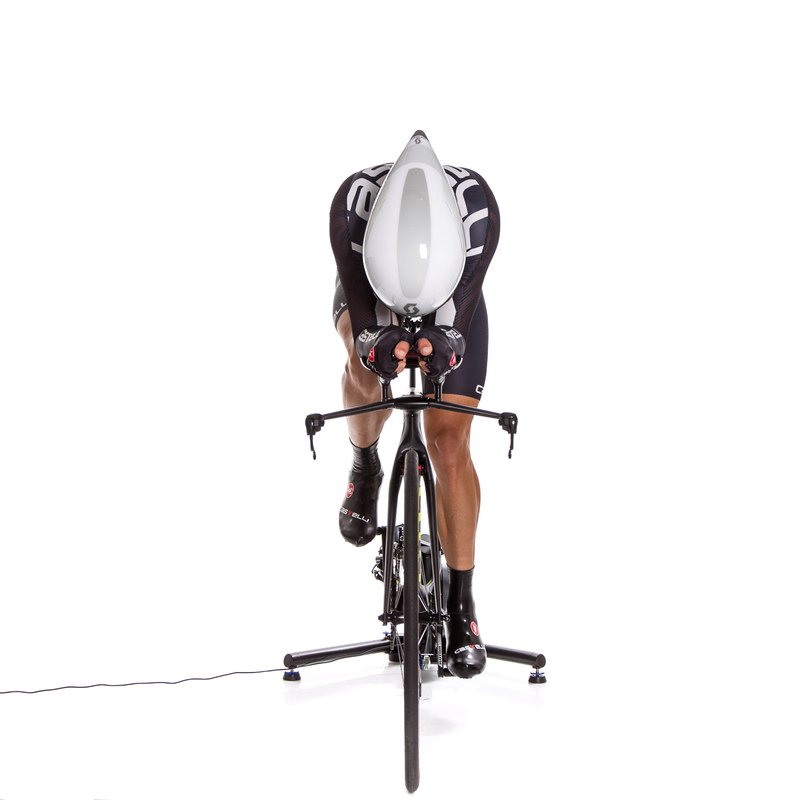 Together with leading aero specialists and experienced biking pros, we have developed an aero helmet with the lowest possible air resistance at high speeds, while simultaneously allowing for dynamic head positioning.